Full body exfoliation and moisturisation will give your skin a pre-holiday boost and ensure it is primed and prepped for the long awaited sunshine. A vigorous all-over body scrub will ensure your tan will last longer, appear more even and be less prone to peeling. This is because the sun colours the top layer of your skin, which sheds approximately every two weeks. 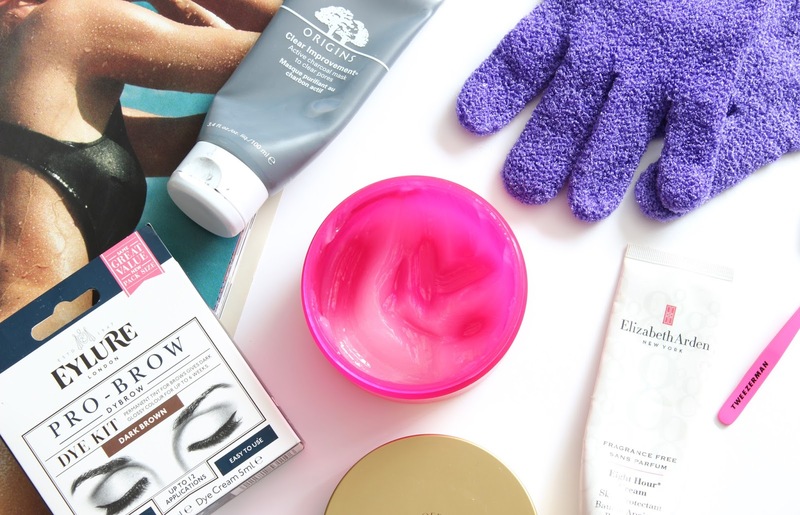 Exfoliation will also leave the skin silky smooth, so scrub away those skin cells and grab your choice of scrub, exfoliating mitts or both and get to work paying close attention to your knees and elbows. Goodbye lizard skin! Exfoliation and moisturisation go hand in hand, so hydrate your body with an all-over deep moisture massage. This will promote circulation, in turn helping the skin to appear smoother in texture, all whilst reducing the appearance of both cellulite and stretch marks. Hair removal is an absolute must. We’ve all seen that one lady sunning herself who is literally bursting at the seams! Forget the razors and hair removal creams, opt for a bikini wax at least 24 hours before your holiday instead. It really isn’t all that bad. Waxing will ensure your bikini line is smoother and far longer lasting. My top tips for a bikini wax, is to exfoliate your groin area prior to your wax and apply tea tree oil post wax to sooth and protect against ingrown hairs. Don’t forget to pack tweezers to pluck out any small hairs if they are to grow back during your holiday. In all honesty I don’t bother with waterproof mascara on holiday, I want to be carefree, not worrying if my mascara is running down my face, as I splash about in the pool! I suggest tinting your lashes before you travel, this can be achieved either at home, or at a beauticians. Don’t forget to pay attention to your brows also, tame them and tint them too as the sun can bleach hair. The colour will last up to two weeks and you will gain effortless structure without the use of brow products. Our skincare routine may serve us well, but it’s always a good idea to give your skin a little extra TLC before a holiday break. You can either book a facial at your local beauticians, or use your favourite products at home. I like to treat my skin with my 3 step detox routine, which gives my skin a much needed hydration boost and leaves my skin looking fresh, bright and more importantly clear of any pesky spots. I for one struggle to find a polish that truly doesn’t chip after a good few days, careless of the price or what it promises. So I opt for a long lasting durable mani and pedi before a holiday in the form of Shellac. Shellac is longer lasting and more durable than your regular polish and lasts around 14 days and even longer on your toes! I have an at home kit which I bought on eBay, but you can have the treatment in store which costs around £25. The application process is relatively simple and your nails will be dry instantly, not to mention look seriously glossy. Also no need to pack polish, or remover! Bonus! I’m sure we are all aware of how sole destroying sandals can be! I like to treat my feet and soak them in a bowl of warm water - you can add bath milk, or a soaking scrub to increase softness. Next, I dry off my feet and exfoliate away any rough areas with a pumice stone, or foot file and follow up with a scrub. To finish, I like to massage a small amount of Elizabeth Arden 8 Hour Cream onto the bottoms of my feet, (any foot cream, or even vaseline will do) and pop on some socks before bed. It may take time to get super smooth feet, so repeat this a couple of times a week and voilà, you’ll be flip-flop ready!